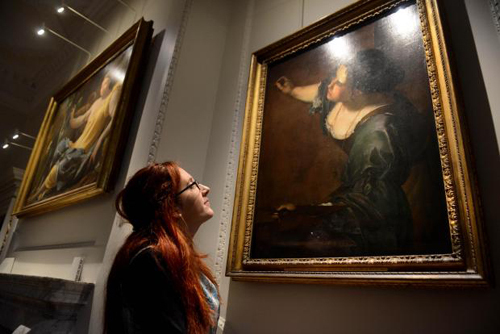 The Cumberland Art Gallery is a new space that has been created at Hampton Court Palace for the display of a splendid selection of works of art from the Royal Collection. 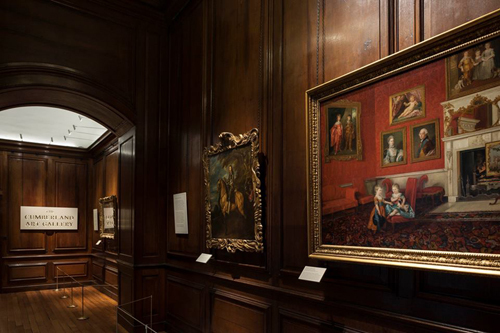 However, rather than conventional gallery walls, we have domestically scaled rooms. The paintings broadly reflect the period of royal residency at Hampton Court, from the Tudor period to the middle years of the 1700s, when great royal collectors and connoisseurs, like King Charles I and George IV, assembled one of the largest and finest art collections of its kind in the world. The Cumberland Suite is situated in the eastern range of Clock Court near the centre of the Palace. It was constructed in the 1730s to accommodate William Augustus, the Duke of Cumberland, one of George II’s sons. The Suite was laid out by William Kent in the 1730’s as private apartments for the Duke and work carried out over a five year period. A purchase of blue fabric to be hung on the walls of the Bedchamber and Large Light Closet was recorded in 1736-37 and it seems that the Suite was not fully decorated and occupied until then. Many of the key elements of Kent’s decorative scheme are well preserved despite being damaged by a fire in 1952 and the Suite marks a key point both in Kent’s development as an architect and interior decorator and more generally the development of gothic revivalism during the Georgian period. The completion of the Suite coincided with the death of Queen Caroline, in 1737 and it was at this point that the Palace stopped functioning as a regular royal residence. From the time that he turned eighteen in 1739 the Duke is likely to have spent little time at the Palace and he had access to other more private properties in London and Windsor. Following his death in 1765 the Cumberland Suite became a Grace and Favour apartment and was occupied almost continuously until 1947. In 1950 the decision was made to transform the Cumberland Suite into exhibition rooms and redecorate it as it would have been in the 1730s. However a major fire in 1952, which started in the apartment directly above the Bedchamber, caused widespread damage to the ceilings and woodwork, particularly in the Bedchamber and the Withdrawing Room. The ceilings were either fully or partially reconstructed immediately and it was not until the mid 1960s that the rest of the Suite was redecorated for use by the Government Hospitality Fund. The last redecoration of the Suite happened in the early 1990s and the Cumberland Suite was, until recently, hung with a large number of Royal Collection artworks and was open to the public as part of ‘The Georgian Route’. Unlike the rest of the Suite the walls of the Entrance Lobby are panelled in unpainted oak. Immediately you are greeted by Johann Zoffany’s intimate depiction of George, Prince of Wales (later George IV) and Frederick, later to be the Duke of York. These were the sons of George III and shown at Buckingham Palace surrounded by art, including two Van Dycks of Charles I’s children. Next can be seen what has been described as ‘one of the most evocative images of British royal portraiture’, a preparatory drawing of King Charles I on horseback by Van Dyck. The route takes us past the Wolsey Closet, which is now the solitary survivor of Cardinal Wolsey’s personal apartments, although somewhat altered. This area contains elements from several periods and has seen much change. Some areas of early eighteenth century panelling remain but much is of a later period modified during the twentieth century. This was one of the principal rooms of the Suite and functioned as a reception space for the Duke of Cumberland. Much of William Kent’s wood panelling and the elaborate plaster ceiling survives although parts of the latter were damaged by the 1952 fire and later repaired. Analysis has shown that the Presence Chamber had been decorated on eleven occasions. It also identified a number of alterations that had taken place including the blocking-up of a door in the north wall and substantial repair to the east wall in the 1960s. It was very interesting to see that during the restoration of ca.1965 the blue scheme that was applied was probably introduced on the basis of paint scrapes which might have revealed the blue seventh scheme of ca.1912. As all previous schemes were off-white it is thought that they were confused for primer and undercoats. Gilding was first employed in this room in ca.1965 but had never been used in the Suite prior to that date. 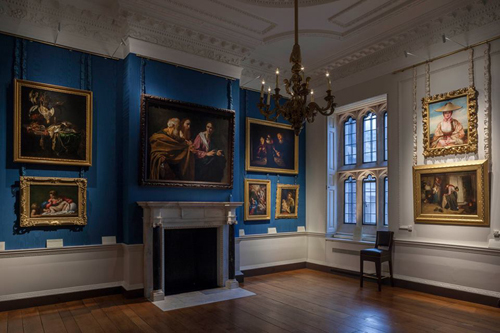 One of the treasures in this room is Rembrandt’s Self-Portrait in a Flat Cap, which was acquired by George IV. Of other noteworthy paintings attention must also be drawn to Artemisia Gentileschi’s dramatic Self-Portrait as the Allegory of Painting (La Pittura). This was one of the works acquired by Charles I. This was another principal part of the Suite and functioned as a semi-public entertainment space for the Duke. It was originally half hung with fabric and half painted and this scheme has been reintroduced. The Withdrawing Room seems to have been decorated on ten occasions since the 1730s. 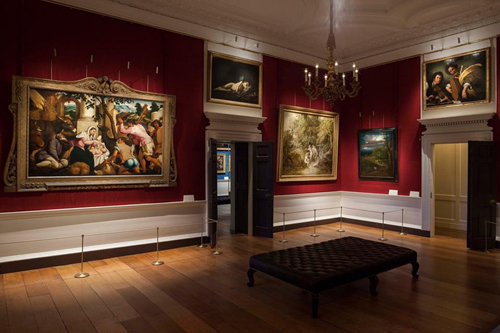 Amongst the works in this room are Gainsborough’s Diana and Actaeon which had also been acquired by George IV. This is part of the Suite that was constructed within the sixteenth century turret added to the east façade of Clock Court by Henry VIII in 1536. 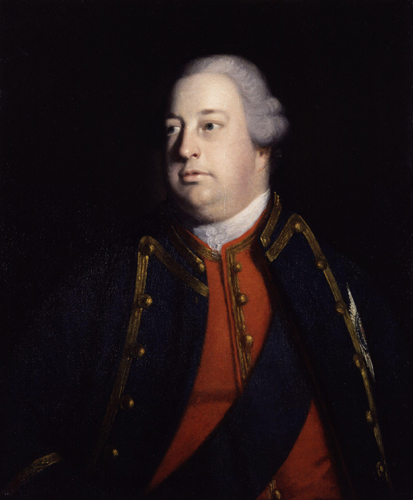 It functioned as a private study for the Duke of Cumberland. The panelling and the elaborate plaster ceiling all date from the William Kent work. 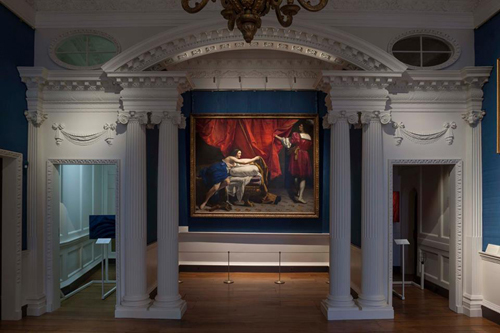 It is known that the room was originally hung with blue fabric and this has been reinstated. 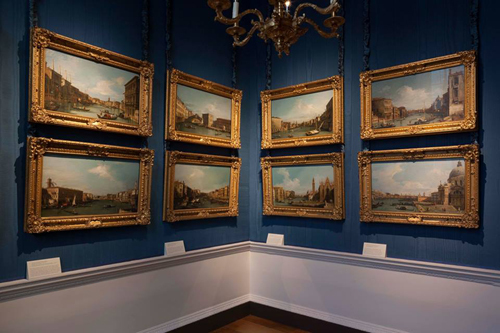 The room, which has been opened to the public for the first time in 25 years, display the twelve smaller ‘Grand Canal’ views of Venice which were painted by Canaletto at the height of his career. This was the principal room in the Suite and served as the Duke of Cumberland’s private bedchamber. The room was heavily damaged by the 1952 fire and the analysis of the paint has shown clear evidence of this, both in the form of smoke damage and in later repairs. Originally this room was also hung with blue fabric but it could be seen that wallpaper replaced this, probably in 1795 when it was occupied by William V, Prince of Orange and last Stadtholder of the Dutch Republic. It had been decorated on ten occasions. The splendid Joseph and Potiphar’s Wife by Orazio Gentileschi which is presented within the bed alcove of the Bedchamber; The Calling of Saints Peter and Andrew by Caravaggio above the chimneypiece, and opposite are the portraits by Holbein of two of Henry VIII’s most important advisors: Sir Thomas Howard, Duke of Norfolk and Sir Henry Guildford. Between the windows hangs the much later Mary Augusta, Lady Holland by George Frederic Watts which was acquired by Edward VII. Either side of the bed alcove can be found the Light Closet which served as a small dressing room and the Dark Closet which housed the Duke’s close-stool. Towards the rear of the Dark Closet is a preserved Tudor door that originally led to a stair turret which was demolished in 1690 to make way for the Kings Staircase. 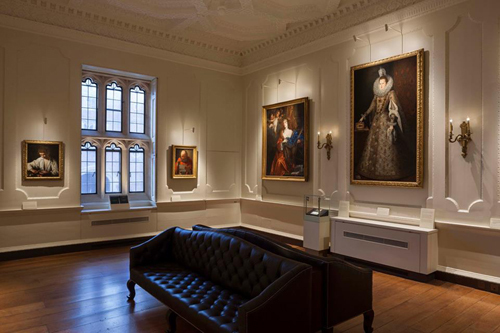 Other artists whose work is hung in this magnificent new gallery include Van Dyck, Georges de la Tour, Annibeale Carracci, Jacopo Bassano, Carlo Maratta and Trophime Bigot. I was asked to carry out an analysis of the history of the decorative treatments within the Suite and to mix paint to match the original scheme. I am particularly grateful to Historic Royal Palaces for information and images provided while working on this project.